This topic has 13 réponses, 0 participant, and was last updated il y a 8 ans et 6 mois by Nellie. I’ve now started doing jumps (like the X) and today I noticed that my Lazer plates make a kind of clicking sound when they hit the ground again. I can sometimes also hear this sound when I do the Nelson. Is that a problem? Does it mean my trucks aren’t adjusted right? I have the same problem with my Lazer : the pivot pin moves in his seat in the hanger. the seat of the pin has become wider. It comes from the bad quality of the material of the hanger. abi, that seems to be exactly what’s wrong with my plate, the pivot pin is not completely in its cup. It moves out a bit when I tighten the trucks. How did you solve the problem with your SER plate? I’ve been wondering if I should tighten my trucks differently (from the bottom end, as it’s done with most other plates, e.g. Ser Elites and Roll-lines)? But then a bit of the kingpin would stick out where the small retaining screw is. Will it harm my plates if I leave them as they are? As for cutting back on chocolate that’s not an option, I’m afraid 😉 , as I’d probably starve then. Oh no, that sounds bad. I think my pin-seat cannot have become wider yet, though, as I have not used the plate for such a long time yet and I have always kept my trucks fairly tight ?! I hope it hasn’t anyway. Do your pivot cups and pin-seats get damaged from jumping or just ‘normal’ use as well? it comes very probably from the fact that your hanger is too high on the kingpin. 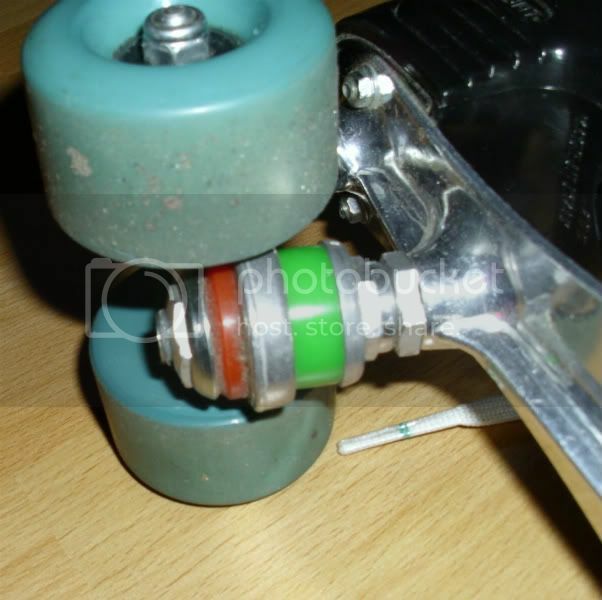 Are your green bushing as tall as the stock lazer bushings ? Stop everybody, parts are missing ! 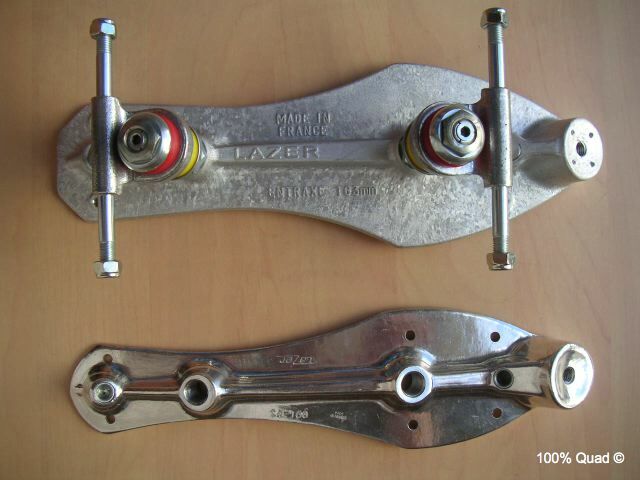 Please find bellow the picture of a millenium and a classic lazer plate. 2 holes : the one for the axle (bushings) and the one for the truck tip (pivot cup ?). Don’t you notice that there is something (pin seat ?) inside the plate to welcome the tip ? And this little « tube » (pin seat ?) is missing on your plates. So your truck is floating inside of the plate. you mean the pivot cup here ? and be sure you use the right terms to avoid any misunderstanding. Yes, they are exactly as tall as the yellow Lazer bushings the plates came with. 😯 That really gave me a shock for a moment before I read on . . .
. . . this little « tube » (pin seat ?) is missing on your plates. So your truck is floating inside of the plate. No, they aren’t. The pivot cups/pin seats are right there in my plates. It’s just that I pushed them in a bit when I cleaned the plates for the photos, and that’s why they’re not visible in the pictures. They’re definitely there!! 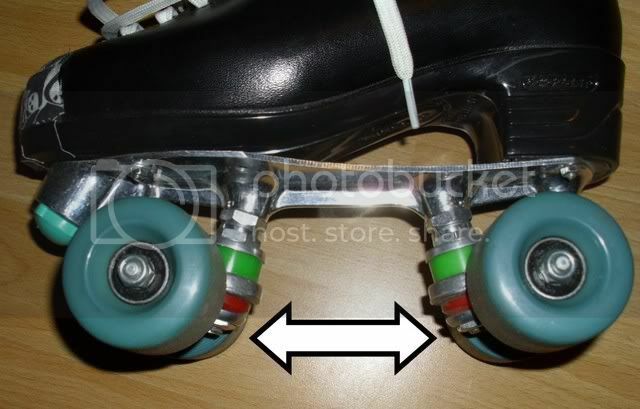 You can see the one at the back axle of the skate in my second picture if you look really hard. What got me a bit worried, though, is that they can be moved in and out a good 2 millimetres – I guess they should not move at all, right? I put some pieces of aluminium tape. It doesn’t completely solve the problem, but it fits better now. OK, so your goal is to put down trucks inside of the pivot cups/pin seats to avoid any parasite movements and its consequences : clicking ! 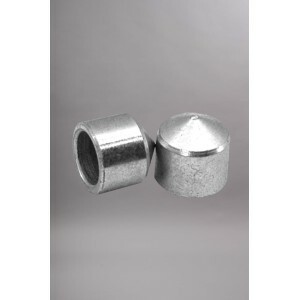 – The kin pin nut on top : tighen till your bushings are correctly hold. (also, you can put a little bit of grease inside of the pin seat to avoid the sound of metal against metal). Xavier, it is very clear to me what you mean and I’ve already done it. My pivot pins seem to have settled themselves lower into their cups now. I don’t know if the clicking sound is gone, because I haven’t been able to jump yet (can’t possibly do that in our flat 😉 and it’s dark outside). My kingpins stick out a little bit from the kingpin nut at the top (near the red bushing) now. Is that a problem? No it is not. We do this for years. Don’t worry.